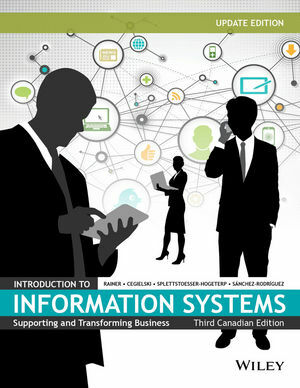 The goal of Introduction to Information Systems, Third Canadian Edition remains the same: to teach all business majors, especially undergraduate ones, how to use information technology to master their current or future jobs and to help ensure the success of their organization. To accomplish this goal, this text helps students to become informed users; that is, persons knowledgeable about information systems and information technology. The focus is not on merely learning the concepts of IT but rather on applying those concepts to facilitate business processes. The authors concentrate on placing information systems in the context of business, so that students will more readily grasp the concepts presented in the text. The theme of this book is What's In IT for Me? This question is asked by all students who take this course. The book will show you that IT is the backbone of any business, whether a student is majoring in Accounting, Finance, Marketing, Human Resources, or Production/Operations Management. Information for the Management Information Systems (MIS) major is also included. The update edition features new and updated cases and examples, as well as the latest coverage of Social Computing, Cloud Computing, Business Process Reengineering, and Enterprise Resource Planning. It is enhanced through the addition of ORION Adaptive Learning, which is now available in WileyPLUS. Chapter 2 (Organizational Strategy, Competitive Advantage, and Information Systems) features a new section on information systems and business processes that discusses the role of information technology in executing processes, capturing input, storing process data, and monitoring process performance. The subsequent section clarifies some of the complexities of business process improvement, business process reengineering, and business process management. Chapter 3 (Data and Knowledge Management) includes a new section on Big Data. A new chapter on Social Computing (Chapter 7) addresses the recent developments in social media and provides current examples of how businesses are embracing social media. Chapter 8 (Information Systems Within the Organization) examines the key systems of transaction processing, functional area information systems, and ERP (Enterprise Resource Planning) systems. By including a new section on implementing ERP systems, students are better able to see the complexities of these systems. This section includes the cloud-based ERP Software-as-a-Service (SaaS) implementation. Another new section, ERP support for business processes, addresses key cross-functional aspects of ERP by providing detailed descriptions of procurement, fulfillment, and production processes. A new Technology Guide (Technology Guide 3) on cloud computing. Technology Guide 5 (Protecting Your Information Assets) examines why it is critical that information assets be protected. It identifies behaviourial and computer-based actions to enable such protection. A new section titled "Protecting your Privacy" has been added that discusses the role of strong passwords, adjusting cookie privacy settings, how to surf the Web anonymously and how to send emails anonymously. What’s in IT for Me? This instructor-praised feature demonstrates how IT topics relate to students in each major Accounting, Finance, Marketing, Operations Management, MIS, and Human Resource Management. Chapter-opening "teasers" list specific tasks for each major that the chapter will help prepare students to do. IT’s About Business boxes feature vivid examples from large corporations, small businesses, government and not-for-profit organizations to show the connection between IT and business. Engaging Pedagogy featuring hands-on exercises, activities, mini-cases with exercises that incorporate software application tools, and an online Virtual Company continuing case (Ruby's Club). Successes and Failures present examples of IT successes and IT failures with lessons learned. Technology Guides offer additional material on technology topics not included in the main text and current hot topics in IT. WileyPLUS is a research-based online environment for effective teaching and learning. WileyPLUS is packed with interactive study tools and resources–including the complete online textbook–to give your students more value for their money. With WileyPLUS, students will interact with integrated multi-media resources including lecture slides, author podcasts, how-to animations for Office applications and manager videos. WileyPLUS is now equipped with an adaptive learning module called ORION. Based on cognitive science, WileyPLUS with ORION, provides students with a personal, adaptive learning experience so they can build their proficiency on topics and use their study time most effectively. WileyPLUS with ORION helps accounting students learn by learning about them.